So how well does that single aluminium heatsink cool two different components? We used OCCT's Linpack test, which stresses the CPU for an hour to verify stability and find a maximum temperature. The testing environment had an acceptable ambient temperature of 25c. With the included 80mm fan mounted on the heatsink, temperatures remained very cool at just 45c loaded throughout the hour. Temperatures without the fan however were less encouraging as temperatures reached in excess of 70c before we aborted the test. While our testing simulates a form of load that exerts a lot more stress on the CPU than real world applications, using the fan is probably a good idea. For a small fan that operated at around 3000rpm, it emitted very little motor noise, at least allowing for a relatively quiet machine even under full load. How well does the included 90W Power Supply Unit cope with the Dual Core Atom CPU, the nVidia chipset and two SATA devices? Using a Multimeter, we monitored the +12V and +5V rails under idle and extensive load for any signs of weakness. The +3.3V rail couldn't be monitored. Our Power Supply Testing was based upon a 1hr run of the OCCT Linpack test followed by three loops of the 3DMark06 synthetic benchmark. The +12V rail remained true to 12.18V (+/- 0.005V) throughout Idle and Load testing and the +5V rail dipped slightly by 0.03V (+/-0.005V) during transitions from Idle to Load, which is still well within specification. There was no obvious sign of voltage rippling or general instability. In terms of heat output, the external power brick does become quite warm but obviously not so hot that it could be considered a hazard. The general assumption here is that Delta Electronic’s 90W Passive Power Supply has no trouble handling a typical Mini ITX system. 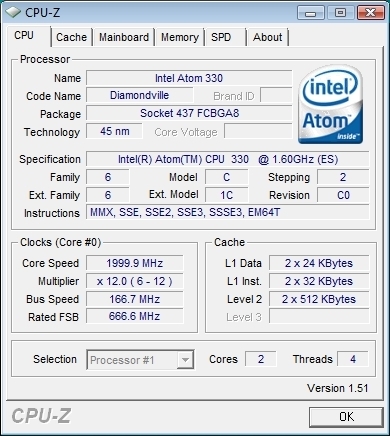 This may seem like a pointless exercise for some, but given that Zotac themselves have implemented overclocking options in BIOS and temperatures combined with the fan are very low, could an overclock help the lowly Intel Atom 330 CPU overcome it’s shortfalls? How far could it go? 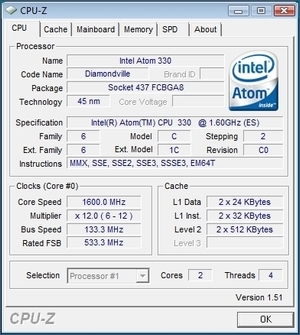 Our testing took the Atom CPU to a healthy 2.00GHz with an FSB of 667MHz, a 25% gain. To see how much of a difference this little overclock made, we thought it’d be an idea to run 3DMark06, Battlefield 2, Far Cry 2, CoD 4 and Cinebench R10 once more. In 3DMark06, not only did the CPU score rise by roughly 25%, the SM2.0 and SM3.0 Graphics scores also rose, hinting that the Intel Atom does indeed hold back nVidia's integrated GPU. From a games perspective, Battlefield 2’s minimum frame rate pushed it’s way above the 20 threshold and the average nearing 40fps making the general game play feel slightly more fluid. The gains from FarCry 2 and Call of Duty 4 however were very marginal and did not improve overall game play at all. Cinebench R10 saw excellent gains with a very promising multi core speedup thanks to Hyperthreading Technology. All in all, small but very respectable improvements in performance and if you really do feel like overclocking your new Zotac ION, then we’d say it might just be worth the try!